While a traditional newspaper in some respects, the Globe and Mail enjoys a reputation as a tech innovator. In 1979, it became the first paper in the world to create a digital archive of its past issues. True, the archive only went back to 1977, but it was a major achievement at the time. Better yet, it was also the first paper in the world to simultaneously publish in print and digitally on the same day. 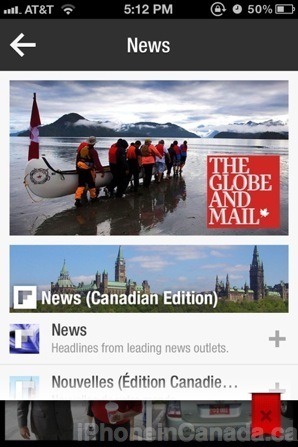 That tradition continues as the Globe and Mail comes to Flipboard. The paper’s local coverage, investigative stories and award-winning international reporting are now paginated and optimized for reading on Flipboard. It’s easy to access the new section. Just launch Flipboard, click on the red ribbon in the top right, then you’ll see The Globe and Mail right away. Flipboard is awesome for getting quick snippets of news with one-handed operation. Are you using Flipboard?